How Do Acoustic Shells Work? Stageright Sites > StageRight Performance > Blog > Acoustic Shells > How Do Acoustic Shells Work? 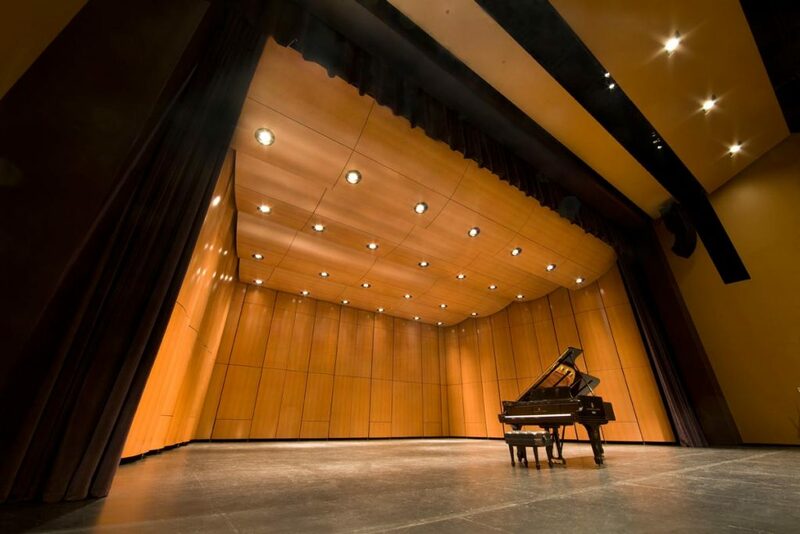 Acoustical sound shells are great for improving the sound projection of your performances and the acoustics of a room. You can check out a blog post about this topic here. To sum it up, acoustic shells go behind the performance to help enhance the sound projection by providing a solid surface to help focus the sound into the audience. They can be used in a variety of applications and environments as well. So, now that we know what they are, we need to know how they work. To start, there are two main categories of shells and those are portable and permanent. This post will dig into how they work and the differences between the two. 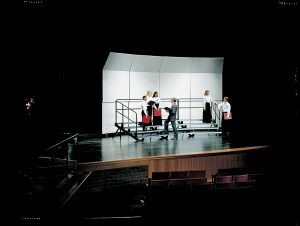 Portable shells can be used in both permanent spaces like a performing arts center, and flexible spaces like a school gym for a choir concert. The photo above is a great example of a portable shell that looks permanent. Even though it’s in a more permanent performance space, the shell towers can be reconfigured if needed. This example includes back and side walls and flown ceilings to complete the system. The photo below is an example of a shell that looks more portable and is designed to be moved quickly and can be stored compactly when not in use. Even though it’s on a stage in the photo, this is a great solution to help support a band or choir concert in a gymnasium. It gives you the benefits of a shell but is not going to be limited to only one space. The shells are placed behind the performance to direct the sound in the way it’s intended to go. 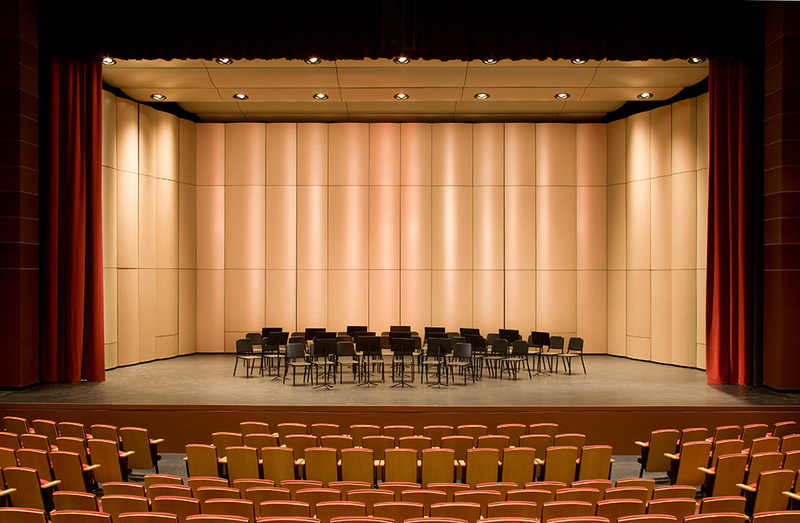 Larger spaces with high ceilings will cause loss of sound and impact the audience’s ability to hear the performance. Two of the things that can dictate how well this will work are how the shells are angled and what the reflective surface is made out of. There are different ways that the shells can be angled. As you can see in the image above, the canopy, or top part of the shell, is angled down because this will help direct the sound down towards the audience in this particular situation. Only certain shell panels feature this adjustable canopy, so if this is a feature your performance space needs, do your research before making a purchase decision. The image at the very beginning of this post includes an angled flown ceilings system, which helps to direct the sound off the stage and towards the audience. This is the same concept that the canopy provides for the more portable band shell. In regards to the surface of the panels, the key is that it needs to be a hard, reflective surface. If it were to be made of something like carpet it would absorb some of the sound instead of reflecting it. That’s why carpet on walls can be good to improve the overall acoustics of the room but they aren’t good for the sound shells. Permanent shells are usually in amphitheaters or purpose-built venues such as opera houses or concert halls. 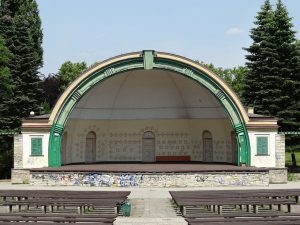 The photo below is a great example of an outdoor amphitheater that was built for a concert application that has a set space and built for one purpose. Permanent shells can be made of a variety of materials such as concrete or wood. A lot of times they have a curved or semi-circle layout just like the one in the photo to project the sound as best as possible, but the downfall of a permanent shell is its lack of flexibility. Once it’s built, you aren’t able to change it around for different performances. Acoustic sound shells are a great way for venues to enhance their sound projection. They can be used for any performance and there are both permanent and portable options. The sound shells work by reflecting the sound back towards the audience so that it doesn’t get lost in the large room or open air. There are a lot of variations when it comes to these shells so if this is something that you’re considering for your venue, it’s recommended that you speak with an expert so that they can help find the best system for you.